Research Associate with ACMS and the South African Research Chair in Mobility and the Politics of Difference at the University of the Witwatersrand Professor Tendayi Achiume has been named by the Human Rights Council of the United Nations to be Special Rapporteur on Contemporary Forms of Racism, Racial Discrimination, Xenophobia and Related Intolerance. The Office of the High Commissioner for Human Rights at the UN made the announcement on Sept. 29, and Achiume assumes her duties on Nov. 1. Achiume, also an assistant professor at UCLA Law, becomes the first woman and first person from southern Africa to serve in the role, which was created in 1993. The special rapporteur is an independent human rights expert appointed by the UN’s Human Rights Council to call attention to the most pressing problems of racial, ethnic and xenophobic discrimination and systemic intolerance around the world. The special rapporteur conducts fact-finding visits, works directly with nations to effect change, and submits periodic reports to the Human Rights Council. It is also a platform for interdisciplinary research and the exchange of knowledge on how to best implement global anti-racism standards. Achiume is the author of several academic publications specifically on racial and xenophobic discrimination and was appointed co-chair of the annual meeting of the American Society of International Law in 2016. She previously taught on the Wits faculty of the International Human Rights Exchange Programme. 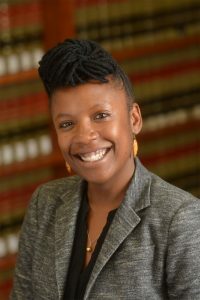 Achiume’s experience also includes clerkships on the Constitutional Court of South Africa, the nation’s highest court; a Bernstein International Human Rights Fellowship with the Refugee and Migrant Rights Project unit at Lawyers for Human Rights in Johannesburg; and work as a litigation associate at Sullivan & Cromwell in New York. She holds a B.A. from Yale University and a J.D. from Yale Law School, where she was managing editor of submissions for the Yale Journal of International Law and a recipient of the Fox International Fellowship and the Howard M. Holtzmann Fellowship in International Arbitration and Dispute Resolution.She is a member of the core faculty of UCLA Law’s Promise Institute for Human Rights, Critical Race Studies program and David J. Epstein Program in Public Interest Law and Policy.